Everyday you and I make many decisions. Some decisions are simple, seemingly insignificant and have little impact. We make these decisions quickly. Other decisions we realize are big decisions and take much time in thought and prayer; we realize the potential life-changing consequences. As I was thinking about an example of a simple decision–eating came to my mind. And, yet, the more I thought about eating, the more I realized the big impact eating has on our lives. We are making decisions in life, everyday, about what we eat. Eating can make the difference between a healthy body or a sick body. Making the little decisions everyday–what we put in our mouths regularly–can have big consequences, even life changing consequences. In the same way, we are making decisions in life, everyday, about what we put in our hearts regularly–these decisions can have big consequences, too, even life changing consequences. Proverbs 4:23 (NLT) warns us, “Guard your heart above all else, for it determines the course of your life.” That’s a WOW verse–God Words that should cause us to stop and think. Gary’s favorite scripture is , “Trust in the LORD with all your heart and lean not on your own understanding; in all your ways acknowledge Him and He will make your paths straight” Proverbs 3:5-6 (NIV). Through the years, Gary and I have talked a lot about Proverbs 3:5-6 as we’ve done life together. The part “in ALL your ways acknowledge Him” some translations say “in ALL your ways seek Him” has stood out to Gary and me. We’ve tried to make this verse a way of life–as we’ve prayed together and sought wisdom, as we’ve made decisions along the path–both small and big decisions. The path hasn’t always been easy, things haven’t always turned out the way we thought they would, however God has faithfully been with us every step of the way. As I think about my Jesus’ great faithfulness to me, then consider me–I realize how easy it is for me to go back to my old ways, making my own decisions, instead of seeking the Lord in everything. My heart’s desire is that my Lord reign in me daily, so I-come-to-Him-daily surrendering to Him afresh, so that I’m making decisions in life that are His decisions and not my ways. And, oh, how I want the Lord to reign in my children and grandchildren each day! I’m sure you want the Lord to reign in your children and grandchildren each day, too. So what do we do? WE MAKE A SIMPLE, YET VERY IMPORTANT DECISION. WE PRAY! We boldly approach Almighty God’s throne of grace and bow before Him lifting our loved ones to Him. I lift Rex and his precious wife, Lanie, their son, Beaux, and daughter, Stella to the Lord daily; also I lift Luke and his precious wife, Angela, and their daughters Bella, Lizzy, Lilly, and Rosey to the Lord daily. GOD IS LISTENING TO OUR PRAYERS! Parents, it is our privilege to pray. We want our children and grandchildren to live their lives fulfilling the plan and purpose the Lord. OUR PRAYERS HAVE A POWERFUL IMPACT! It says so in God’s Word, “The prayer of a righteous person (mom or dad) is powerful and effective” James 5:16b. 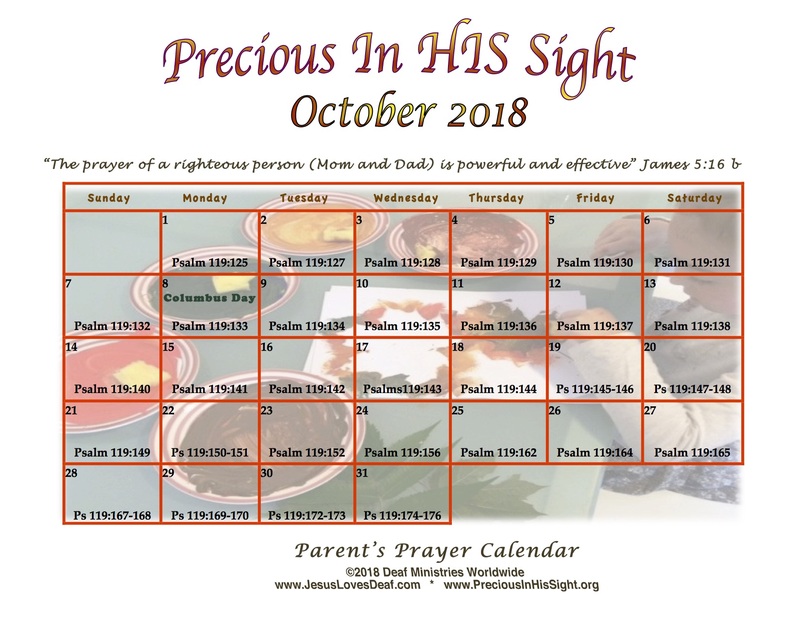 Through the years the monthly Precious In HIS Sight Prayer Calendar has helped me faithfully pray for my loved ones. Click on the Calendar and it opens enlarged in a new window making it easy to read the Bible references. Look up the scripture for the day with me and let’s turn God’s Word into prayers. I print my Calendar and keep it in my Bible. I encourage you to print the Calendar too. I have seen God do more than I have asked! Praise the Name of Jesus forever! “God is able to do immeasurably more than we ask or imagine, according to His power that is at work within us, to Him be glory in the church and in Christ Jesus throughout ALL generations, for ever and ever! AMEN” (Ephesians 3:20-21). LET’S ASK MORE! THANK YOU, OUR FAITHFUL GOD!!! Next Post 65 and Still Alive! Yamilita, you are such a big, encouraging blessing to me my friend! You have been encouraging me since, well, I lost track of the time…it’s been THAT LONG! There’s a song that says something like, “friends are friends forever when the Lord’s the Lord of them”…that’s you and me. We are blessed to have our GIFTS from God…how could we not pray for them…WE MUST…and it’s such a GOD JOY to lift our loved ones to our Lord! Love and Holy Hugs!